No waiting for service or emergency trucks. No need for jump-starts (jump-starting damages the battery, alternator and potential major damage to computers and electrical system). No more down time or lost man hours. It is preventative maintenance that pays for itself 1st time it saves you. Using portable battery chargers/boosters, dangerous jumper cables, or calling a tow truck means you have already experienced a damaged battery (first time battery goes dead it has lost 1/2 its service life). Universal design fits top and side post batteries. No hardwiring or modifications required. Transferable. Manufactured to ISO, USCG, and SAE standards. If you have any questions about this item, please give us a call (800)355-2956. 1. Existing vehicle positive cable to PriorityStart! 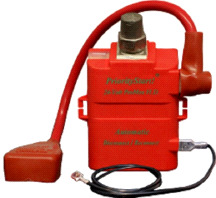 The 24-Volt version of the PriorityStart! is specifically designed for any 24-Volt battery, or 12-Volt dual batteries wired in "Series" (that is, from positive on battery 1 to negative on battery 2). The 24-Volt system works and installs just like the 12-Volt ProMax and features the same benefits! However, the disconnect threshold is factory set at 23.5 volts. The 24-Volt application is most often seen in farming, military and many international vehicles found outside of the United States.